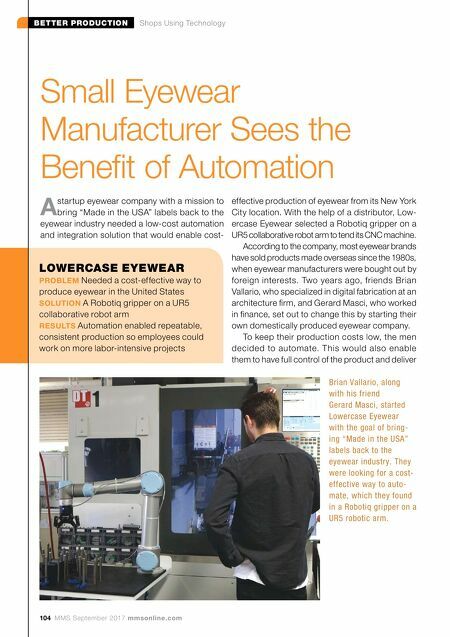 104 MMS September 2017 mmsonline.com BETTER PRODUCTION Shops Using Technology LOWERCASE EYEWEAR PROBLEM Needed a cost-effective way to produce eyewear in the United States SOLUTION A Robotiq gripper on a UR5 collaborative robot arm RESULTS Automation enabled repeatable, consistent production so employees could work on more labor-intensive projects Small Eyewear Manufacturer Sees the Benefit of Automation A startup eyewear company with a mission to bring "Made in the USA" labels back to the eyewear industry needed a low-cost automation and integration solution that would enable cost- effective production of eyewear from its New York City location. With the help of a distributor, Low- ercase Eyewear selected a Robotiq gripper on a UR5 collaborative robot arm to tend its CNC machine. According to the company, most eyewear brands have sold products made overseas since the 1980s, when eyewear manufacturers were bought out by foreign interests. Two years ago, friends Brian Vallario, who specialized in digital fabrication at an architecture firm, and Gerard Masci, who worked in finance, set out to change this by starting their own domestically produced eyewear company. To keep their production costs low, the men decided to automate. This would also enable them to have full control of the product and deliver Brian Vallario, along with his friend Gerard Masci, started Lowercase Eyewear with the goal of bring- ing "Made in the USA" labels back to the eyewear industry. 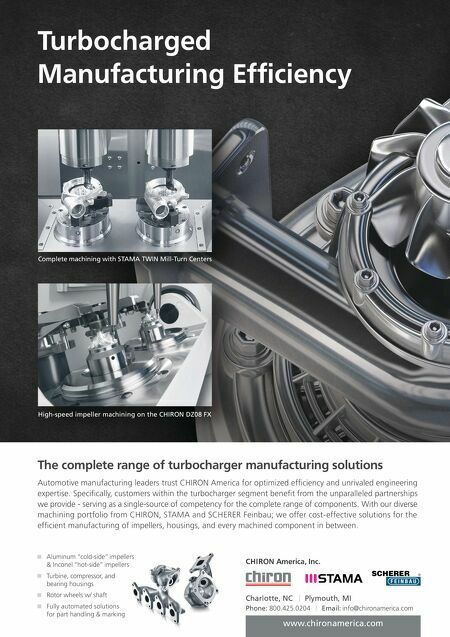 They were looking for a cost- effective way to auto- mate, which they found in a Robotiq gripper on a UR5 robotic arm.